Stay tuned for the recap coming up soon on Vavel! Third period (0:00) - And that's gonna do it for game one! There are some pushing and shoving matches going on to end the game, but still the same outcome, 5-2 Tampa. Third period (1:12) - Well that's all she wrote folks. Stamkos creates the turnover and Nikita Kucherov takes it down the ice to put them up 5-2 and get the empty netter. Third period (1:40) - New Jersey takes their timeout down by two to discuss what's next. New Jersey only has four shots on net this period. Third period (4:00) - Hall had a great end-to-end rush that resulted in nothing but a turnover to Tampa. New Jersey has to have their playmakers step up next game or they are going home early. Third period (4:52) - Even though he has let in four goals, Kinkaid has played very well. This game could be a lot worse if he wasn't in the net. Tampa is walking all over New Jersey, and the Devils have no response or counter to the pressure. Third period (6:15) - The Devils have only two shots this period as Tampa and their fans have come alive. Third period (7:30) - Lightning have come alive now and are throwing their bodies around. Hall got nailed on the boards and New Jersey is completely flat-footed right now. Third period (7:46) - And that's two points on the night for Gourde! Tampa makes it 4-2 on a 3-on-2 off a bad turnover by New Jersey. Alex Killorn gets the feed from Gourde to put them up by two and probably put this out of reach. Third period (8:30) - Tampa is playing a little too conservatively and collapsing too much for the lead they have. New Jersey has settled in and have stopped being afraid. Third period (9:45) - Hall and Palmeri are credited with the assists on Zajac's goal. That was just the Devils second shot of the third period, and it makes them 1-of-2 on the powerplay tonight. Third period (10:25) - Well don't give these guys powerplays! A great pass by Hall to give Travis Zajac the redirection on the powerplay to make it 3-2 Tampa. Third period (10:49) - We have our third penalty of the night as J.T. Miller goes to the box for slashing. New Jersey goes on the man advantage for the second time tonight. Third period (10:50) - New Jersey still has yet to get a shot on this period. New Jersey just can't compete with Tampa's playmakers. Third period (10:57) - Tampa is keeping the puck in New Jersey's zone with ease as New Jersey can't get it out. Kinkaid is truly standing on his head and Tampa should have at least two more as the Gourde line gets to the net again with no success. Third period (15:15) - This was not the start that New Jersey looking for as they have yet to get a shot on net this period. Third period (16:20) - Tampa is just a better team will be the story of this game. New Jersey can't sustain significant pressure at all and Tampa knows it. Third period (18:30) - A slow back and forth again as Tampa just wants to play keep away. Third period (20:00) - Period number three underway! Second Intermission - Tampa is waiting for the Devils to dump the puck in the zone, and New Jersey has to stop doing that. They have to come on flying in the third and keep up the defensive play because a two-goal lead is always the unsafest in all of hockey. Second Intermission - A better response from New Jersey this period as Hall scores a goal to bring them within two. They played much better in front of Kinkaid this period and left him out to dry far less. The turnover to Hall was unfortunate for the Lightning, but they are still dominating 5-on-5 play. Both teams became passive and New Jersey never took advantage of Tampa hanging back. Second period (0.00) - Well, that's the end of two periods in game one. Tampa is leading New Jersey 3-1 and the shots are 26-20 in favor of New Jersey. Second period (25.7) - Someone is eventually going to fight here as a pushing match breaks out again in front of Vasilevskiy. Second period (1:17) - A lot of passive play from both teams right now. Brian Boyle is getting chippy with Gourde now, and Tampa has poked the bear. Second period (4:45) - Shots are now in favor of the Devils 22-19. Second period (6:05) - GOOOAAALLLL! It is now 3-1 Tampa as Hall gets the turnover and shoots it by Vasilevskiy to get his first career playoff goal! Second period (6:20) - New Jersey is finally starting to apply some pressure on Tampa, but they continue to hold them at bay. Nico Hischier is battling really well down in the dirty areas, the defensemen for the Devils are starting to step up, and guys like Taylor Hall are starting to flex their playmaking abilities. Second period (7:00) - Some great opportunities for both teams as the goalies continue to stand strong this period. Second period (8:20) - A great powerplay by the Devils, but nothing shows as Vasilevskiy stands strong. Things are starting to pick up now. Second period (9:30) - What an awesome sequence by both teams! Great passing by New Jersey leads to two chances in a row then a great effort play by Tampa lets them clear the puck. Second period (10:32) - We have our second penalty of the night as Brayden Point goes to the box for tripping as New Jersey gets their first attempt on the powerplay. Second period (13:20) - The shots are 18-15 in favor of Tampa. The pace of play is heavily in favor of Tampa as it seems like New Jersey can't even get set up in Tampa's zone. Second period (17:29) - Vasilevskiy makes a flurry of saves on Michael Grabner but the game remains 3-0. New Jersey is trying to get some offense going, but they just are getting outplayed by Tampa. Second period (18:06) - Palat and Sergachev get the assists on the goal. Second period (18:06) - And Gourde finally converts on the powerplay! Palat inadvertently kicks it over to Gourde and makes it 3-0! Second period (18:43) - A great shot by Steven Stamkos is gloved by Kinkaid to keep 2-0. Second period (19:55) - Miles Wood gets the first penalty of the game, and Tampa's red-hot powerplay gets their first chance of the contest. Second period (20:00) - Here we go! The puck has been dropped for the second! First Intermission - New Jersey has to come out and play better in front of Kinkaid. Even though it's 2-0, Kinkaid has been playing very well for his first career playoff start. It's not that the Devils are playing bad, they just have to account for Tampa's speed and playmaking ability better. The Devils played well in the opening period, they just have to play even better in the next two. First Intermission - Tampa controlled the pace of play for most of that period and even when it seemed like New Jersey was applying some pressure, Tampa would cause a turnover and bring the puck the other way. First period (0.00) - Tampa skates to the locker room with the 2-0 lead early in game one. The shots were in favor of Tampa, 13-11. First period (28.5) - The Johnson line strikes again! A fantastic saucer pass from Palat sets up Johnson in the slot for the early 2-0 lead! First period (1:25) - Two very good shots by New Jersey challenge Vasilevskiy, but he covers the puck as things start to get chippy again. First period (2:14) - New Jersey is trying to take it to Tampa and apply defensive pressure, and it's kind of working, but Tampa just looks better. First period (5:00) - Wow this line is off to a great start! Tyler Johnson gets the puck Ondrej Palat to give Tampa the 1-0 lead! It was a great move by Palat to get in front of the net and put it home! First period (5:10) - New Jersey can't seem to get it past center ice as Tampa is just completely dominating play. New Jersey keeps dumping the puck in and can't get set up in the offensive zone. Tampa is taking advantage of New Jersey's lax play and turning into offense and good scoring chances. First period (6:46) - The Devils apply some pressure but can manage to get a shot on net, and Tampa then turns it into an offensive chance at the other end. First period (9:00) - Tampa just needs one bounce to go their way and this game maybe 3-0. Kinkaid and the Devils standing strong though. First period (9:22) - More pressure from the Gourde line as Kinkaid makes another stop on a great Tampa chance. The game is still scoreless though after a little bit more than halfway. First period (10:57) - Really fast pace of play that seems to be favoring Tampa right now. First period (13:10)- Wow! What a move by Yanni Gourde just to be turned away by the defense! Tampa jumps on New Jersey early as Mikhail Sergachev gets shaken up for Tampa. The Devils swept the season series 3-0 against Tampa. Keith Kinkaid and Andrei Vasilevskiy get the start in the net for their respective teams as the puck drops to start the first period! Welcome to Vavel's live coverage of the first round of the 2018 NHL Playoffs! 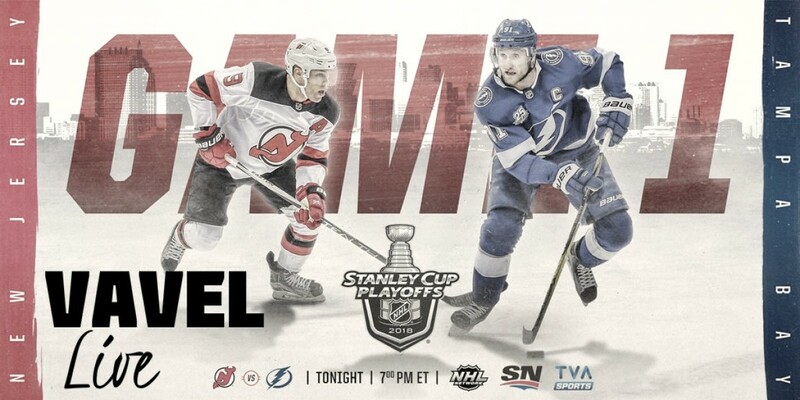 We bring you live updates and coverage of New Jersey Devils versus the Tampa Bay Lightning!